The internet deleted its first virtual country this month. It wasn’t that bad: Timor-Leste is now a real country, and doesn’t need its original internet domain name any longer. But the .tp top-level country domain name (ccTLD, in the lingo) has a story to tell as it ends its 18-year history. In 1997, the former Portuguese colony of Timor-Leste (East Timor) was nearing the final years of its struggle for independence from a brutal Indonesian military occupation that had started in 1975. Using a hosting service in Ireland, a contact address for the most famous Timorese political prisoner, and a clever tactic to squat on an unclaimed county code, activists launched the top-level domain .tp and its first site, freedom.tp. It was a period when all countries and territories had recently been assigned two-letter codes, alongside the .com and .org domain suffixes. Most of these are familiar – .ca for Canada, .id for Indonesia, .ie for Ireland, and so on. In 1997, many country domain names were unclaimed. Among them was .tp, reserved for Portuguese Timor (Timor Português). Portuguese Timor had long ceased to be. The 1974 Carnation revolution in Portugal set the last European world empire’s colonies on the road to independence. That included Portuguese Timor, the eastern half of an island off the north coast of Australia, sharing its other half with an Indonesian province. The leading Timorese political party declared the country’s independence on November 28, 1975. On December 10, the Indonesian army invaded. The next 24 years spelled famine, death, and near-genocide as pro-independence fighters resisted Indonesian annexation. But to the United Nations, nothing had legally changed. Each year, the UN special committee on decolonization considered the question of Portuguese Timor, asking the recognized administering power to account for its progress in ending colonial rule. Portugal’s government replied that it would be happy to supervise an independence process, but pointed to the small matter of an Indonesian military occupation preventing any such step. The ritual seemed bizarre, but was symbolically crucial: it maintained the status of Timor-Leste as a territory whose political status was separate from that of Indonesia. And thus, when the internet emerged, Timor-Leste was assigned a top-level country domain: .tp, recognizing its legal status as a Portuguese territory. Connect Ireland, that country’s pioneer internet provider, noticed the name remained unclaimed and in 1997 consulted Timorese independence leaders in exile. Timor-Leste was under Indonesian rule and the local military authorities were hardly likely to approve a country code that might displace Indonesia’s .id in what, according to the Indonesian government, was their 27th province. Connect Ireland decided to grab the name. They needed a contact person in the territory, but any local contact was sure to be arrested. So they opted to use one already under arrest – Xanana Gusmão, leader of the Timorese armed resistance. Xanana’s last known address was a prison cell at the local Indonesian military command. So be it: that was the local contact address used. Domain registry authorities accordingly released .tp and Connect Ireland brought it into being. When in November 1991 Indonesian soldiers opened fire on a pro-independence protest in Dili, the Timorese capital, three Western journalists were present. 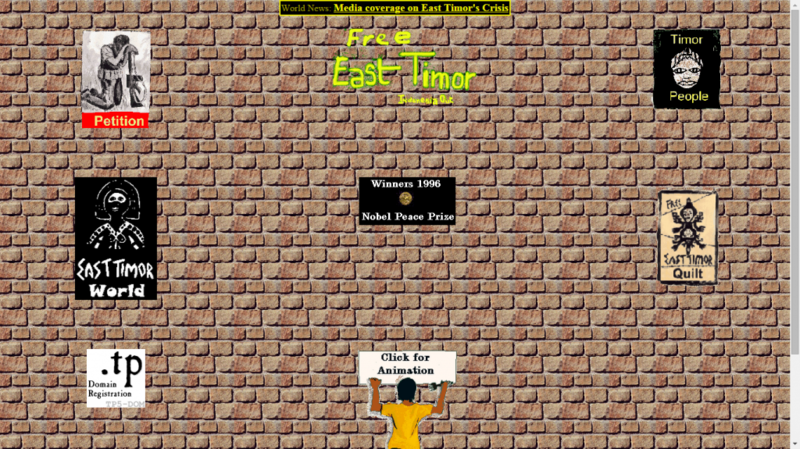 It was reg.easttimor that carried the news to solidarity groups across the world. Activists in Toronto dropped their plans to campaign for an up-and-coming mayoral candidate named Jack Layton on the city’s mayoral election day, and rushed to put out press releases about the killings on the other side of the world. These beat the Department of External Affairs into print in Canadian newspapers. Keeping e-mail messages short to save phone bills, they organized a visit by the Timorese independence movement’s representative in New York in time for him to protest outside External Affairs Minister Barbara McDougall’s Toronto constituency office. The minister herself was at meetings in South Korea, and slower to respond to the developing story – though declassified messages from External’s own electronic communications network show she did ask the Canadian ambassador in Indonesia to deliver a message about Canadian concern for human rights. The point is that an impossibly obscure issue emerged on to the international agenda thanks in part to video images of a massacre, but also to solidarity groups’ early embrace of e-mail and newsgroup subscription tools. These forms of communication were so important that activists were soon fundraising to buy a laptop for Xanana, the Timorese guerrilla leader. American supporters ensured that groups not connected to the internet could still take part in reg.easttimor discussions by printing out hefty “document collections” compiled from online postings and mailing them every few weeks to supporters from France to the Philippines. It made sense, then, for Connect Ireland to grab the .tp suffix in 1997. It was domain name squatting, but key exiled Timorese independence activists gave their blessing to Connect’s Martin Maguire to claim .tp and create registries within it that would mimic a potential future Timorese government (at .gov.tp). It was “the world’s first virtual country,” activists boasted. If places like “virtual Tibet” lived in romantic stories of monks and lamas, on movie screens, and in Buddhist worship groups, “virtual Timor” could boast what no other exiled independence movement could – its own domain name. On the ground Indonesia controlled almost all of Timor-Leste. Online, Timor-Leste had symbolic equality, matching .tp to Indonesia’s .id as if both were equal countries. Symbolic politics spelled the demise of .tp, too. It always rankled that the domain assigned stood for Timor Português, not Timor-Leste. Requests to change it mounted after the UN sponsored a referendum in 1999 in which over 78% of Timorese voted to become independent of Indonesia. The UN supervised an interim administration before Timor-Leste regained full independence in 2002. The Timorese government soon won their case and .tp began to be phased out in favour of a new .tl suffix. These things take time – a decade ensued in which .tp sites were slowly migrated to the .tl domain. The process complete, .tp was finally deleted entirely at the end of February, 2015. The audacity of 18 years earlier had become anachronism. But a reflection on its lifespan shows how activists used a mundane tool for creative action, and helped to change a country’s future. David Webster is an associate professor in the history department at Bishop’s University. David T. Hill and Krishna Sen, The Internet in Indonesia’s New Democracy (Routledge, 2005). Fascinating stuff! Thanks for this, David – a very interesting web history. One quick note: it’s not completely deleted. The Internet Archive has at least some of the .tp domain, as seen here: https://web.archive.org/web/*/http://freedom.tp. Thanks Ian! Yes, wayback machine is a wonderful resource – that’s where I grabbed the screen shot in all its 1990s goodness, in fact. Appreciate you sharing that link!